A literary travelogue into the heart of classic Southern literature. What is it about the South that has inspired so much of America's greatest literature? And why, when we think of Flannery O'Connor or William Faulkner or Harper Lee, do we think of them not just as writers, but as Southern writers? 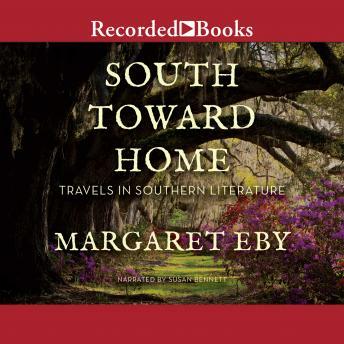 In South Toward Home, Margaret Eby-herself a Southerner-travels through the South in search of answers to these questions, visiting the hometowns and stomping grounds of some of our most beloved authors. From Mississippi (William Faulkner, Eudora Welty, Richard Wright) to Alabama (Harper Lee, Truman Capote) to Georgia (Flannery O'Connor, Harry Crews) and beyond, Eby looks deeply at the places that these authors lived in and wrote about. South Toward Home reveals how these authors took the people and places they knew best and transmuted them into lasting literature. Side by side with Eby, we meet the man who feeds the peacocks at Andalusia, the Georgia farm where Flannery O'Connor wrote her most powerful stories; we peek into William Faulkner's liquor cabinet to better understand the man who claimed civilization began with distillation and the "postage stamp of native soil" that inspired him; and we go in search of one of New Orleans's iconic hot dog vendors, a job held by Ignatius J. Reilly in John Kennedy Toole's A Confederacy of Dunces. From the library that showed Richard Wright that there was a way out to the courtroom at the heart of To Kill a Mockingbird, Eby grapples with a land fraught with history and mythology, for, as Eudora Welty wrote, "One place understood helps us understand all places better." Combining biographical detail with expert criticism, Eby delivers a rich and evocative tribute to the literary South.